I've had a bulletin board sitting around for awhile and didn't know what to do with it until now. I'm totally bummed, though, because I took before pics this time so you could see the total transformation, but my SD card is messed up and I lost them. Along with all the other pictures I hadn't downloaded yet. Bummer. So just know that is was painted white with red and blue flowers, okay? Got the mental picture? Good. We can continue. I got a scrabble game for 50 cents at a yard sale and turned the letter tiles into tacks for my board! I put a dot of E6000 glue on the back of each tile and attached a flat heat tack to each one. Easy and super fun to use! And there you have it. 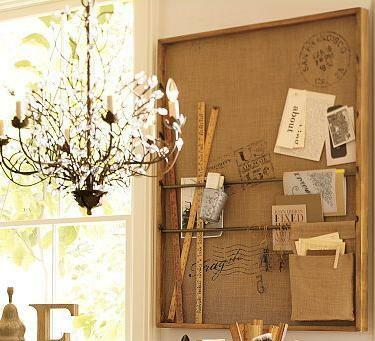 Rustic Wall Organizer & Scrabble tacks to keep our office space neat and tidy. I can't wait to use it!